Will Cameron's new body cut through EU red tape? David Cameron has just announced that he’ll set up a new “task force” consisting of some of the UK’s best business leaders. Their task is to identify EU rules and regulations that are currently holding back business and growth, which should therefore be scrapped. We’re told it’s a government initiative rather than a Tory initiative, and it’ll be led by Business Minister Michael Fallon MP. Apparently, the idea is to complement the balance of competences review – looking at individual rules from a business perspective rather than overarching EU powers. Now, this will no doubt be met with cynicism. Politicians often blow smoke about cutting bureaucracy and promise to set light to “bonfires of red tape” but somehow the flames never materialise. Meanwhile, such 'taskforces' have a mixed record in terms of results to say the least. Will this time be the same? Writing in the FT, a few days ago Ian Cheshire argued that “As an international retailer, Kingfisher wants Britain to remain in the EU – but a reformed EU… We enjoy the certainty of a single rule book across the EU but not at the cost of an ever increasing regulatory burden, which must be resisted”. Speaking to the BBC’s Today programme, Paul Walsh has said "I support the fact that our prime minister said we should stay in Europe. We are a trading company. We must stay in Europe, we must position Europe for the future, which is more competitive, less regulation." The others have not said anything in detail about the EU per se but also have considerable business experience in cross-border trade. Has driven the opening of stores in Paris and other EU capitals, likely making him familiar with the constraints of expanding British business in Europe. Launched Vodafone New Zealand in 1992. Co-founded Omega Logic in 1999. Lots of experience as an entrepreneur and as a business investor. Experience in telecoms which is becoming a hot topic in terms of single market integration and trade. BTG has offices in Germany and previously President of Strategy and Business Development Europe at Baxters so she has solid background in conducting business across the EU. ATG Access is the worlds largest manufacturer of security bollards and vehicle barrier systems, currently exporting to over 42 countries. So the jury is still out. But with the group set to provide its first concrete recommendations as soon as September we'll soon see, and given the huge importance of scrapping and improving EU rules and regulations we’ll give No 10 the benefit of the doubt on this one. On Wednesday, European Parliament President Martin Schulz wrote to Irish Deputy Prime Minister Eamon Gilmore warning him that the latest compromise on the long term EU budget agreed by EU leaders in February would be rejected. Yesterday morning, however, a deal was struck between the two negotiating teams. So had member states suddenly given in to all MEPs’ demands? Although not all the details are fully clear, it looks as though MEPs have not secured anything substantial above and beyond the compromise they rejected last week. Retaining unspent funds and ‘flexibility’ – A decent win for MEPs; member states have agreed that rather than taking back unspent funds as before, these can be rolled over to next year’s budget – although a) in recent years there has not been much of a surplus and b) while unlimited unspent funds can be rolled over at the start of the seven year period, this is capped towards the end. There is also scope for moving some cash around between budgetary headings. Topping up the 2013 annual budget by €11.2bn – A big win for MEPs who demanded payment in full of the additional €11.2bn requested by the Commission to retroactively top-up the 2013 budget (although this is less down to MEPs themselves and more down to the fact that annual budgets are decided under majority voting). So far €7.3bn has been committed despite the UK voting against. This leaves €3.9bn outstanding and Martin Schulz has already warned that if member states renege on this, after MEPs have approved the budget, they will hold hostage the 70 or so individual pieces of implementing legislation for the EU's long-term budget. A mid-term review: It looks as though MEPs have secured their demand for a compulsory review mid-way through the seven year budget but crucially it seems all but certain that this will take place under unanimity, not majority voting as MEPs had demanded, a scenario which could potentially have seen the spending limits increased. Intriguingly, this could coincide with a UK referendum should David Cameron still be in Downing Street. Direct EU budget taxes – A big defeat for MEPs who pushed for a complete overhaul of the “own resources” system which would have seen the introduction of direct EU taxes and the scrapping of the UK and other rebates. This issue is completely left off the Commission’s press release and at a press conference following the agreement, the parliament’s negotiator only mentioned further “debate” on this issue. This was a clear red line for member states. Extra help for youth unemployment – MEPs have also secured an additional €2.5bn to help combat youth unemployment, although this will be reallocated from existing funds, so it is not new money. Member states will also be able to voluntary commit additional funds in this area if they chose to. So, despite a huge amount of posturing, overall the threat to veto the agreement proved to be an empty one and many of the MEPs' key demands were unmet - as we predicted at the time. They will now get two votes on the long term budget – a non-binding one next week and then a binding one come September or October. A lot could still happen between now and then, especially if MEPs decide they want another stab at obtaining further concessions or if member states refuse to pay more money into this year’s budget. Even though the UK would not have been in a bad position had the parliament vetoed the agreement, politically it is better for David Cameron to be able to point to a concrete cut (as has already been proposed for the 2014 budget) as this adds credibility to his argument that he is able to secure a better deal for the UK in Europe. There’s been a lot happening on the EU budget front in the last couple of days – the 2014 draft budget was proposed yesterday and this morning a deal was finally struck between the European Parliament’s negotiating team and the Irish Presidency on the EU’s long term budget (more on that later). Meanwhile, David Cameron has arrived in Brussels for the EU summit pledging to protect the UK rebate, with PA reporting that France is allegedly pushing for a change in the way the rebate is calculated so that it does not cover the rural development part of the CAP, a move which could reduce it by around 10%. Cameron said that “It is absolutely essential that we stick to the deal we reached in February and that we protect the British rebate, and I will make sure that we do that”, adding that he wants it “locked down”. This issue first came up in November when Herman Van Rompuy proposed reducing the UK rebate in this way, and David Cameron rejected it out of hand. We flagged this up here and calculated that it would reduce the UK rebate by €3.5bn (11%) over the seven year budget period (Although it should be noted the rebate is likely to fall anyway as a result of greater expenditure in the new member states). The conclusions of the February summit, where the deal was finally struck, clearly state that “the existing correction mechanism for the United Kingdom will continue to apply”. Given that the rebate is embedded within the EU’s so called “own resources” regulation, which is decided under unanimity and therefore protected by UK veto, it would appear France's demands could only be met by unpicking the entire budget deal agreed in February, for which there is no appetite among other countries. It is therefore difficult to see how this is a credible threat, although it does make for good publicity for both Cameron and Hollande. Is video of MEPs slapping reporter being censored? On Tuesday Open Europe posted on its blog and YouTube account a video of GeenStijl reporter @TomStaal being pushed about and slapped by MEPs after he confronts them for allegedly 'signing on and sodding off,' or for collecting a €300 daily allowance from the European Parliament without actually doing any work. The video since went viral, getting thousands of views in only a few hours. But this morning, we were surprised to discover that the video had been blocked and removed. Reason? Copyright infringement claim. Screenshot of our 'Sign In Sod off' video being blocked on YouTube for copyright reasons by R.T.I. But the story gets stranger. It’s not GeenStijl that’s behind the removal – quite the contrary, in fact – Geenstijl wants maximum exposure. Instead it's Italian mass media company R.T.I. Tom Staal has confirmed to us that Geenstijl has absolutely no affiliation with R.T.I, and that they have no idea why their video is being blocked – and Staal isn’t happy. So what in the world is going on here? Well, we’re baffled, and plead for help from any savvy readers informed about copyright issues. But here’s a theory. R.T.I’s chief executive is Silvio Berlusconi's son, Pier Silvio. 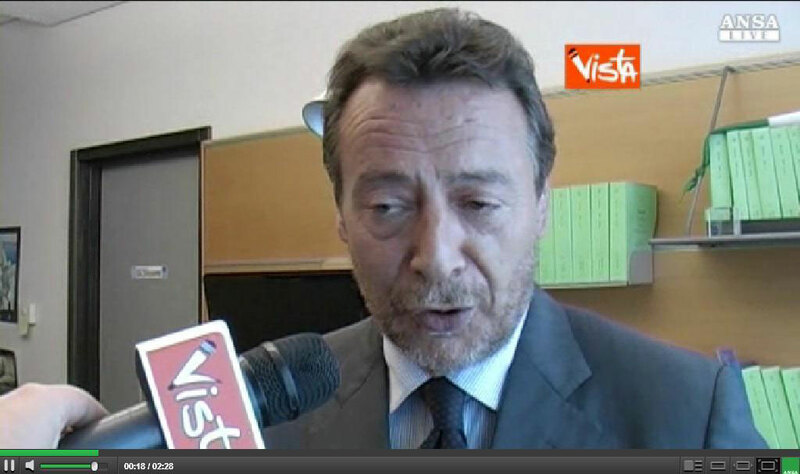 The R.T.I copyright claim happens at the precise moment where the face of Italian MEP Raffaele Baldassarre appears. And it also happens happens that Baldassarre is a member of Silvio Berlusconi's 'Il Popolo della Libertà' party. Just precisely what is going on we don’t know...but that ***** of a Silvio Berlusconi has apparently succeeded in removing Tom Staal's report from Brussels from YouTube...Uploaders which have submitted a copy of the video on their channel are all suffering from bizarre vague copyright claims. There are even copies circulating where only the scene of the aggressive Raffaele Baldassarre is being blocked. That’s all very coincidental. Hey Silvio Berlusconi, stay clear off our internet! A very big vaffanculo! 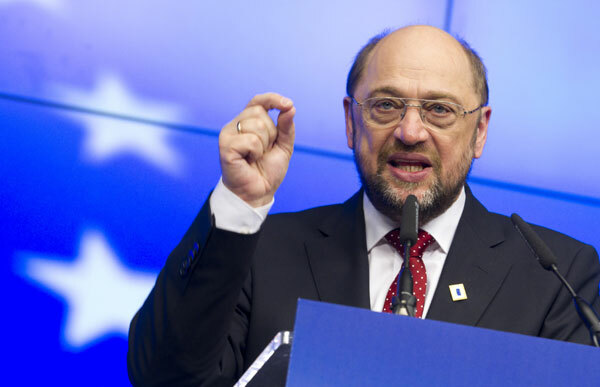 Update 18.45: Tom Staal tells us that Martin Schulz, European Parliament President, may be launching an investigation against him and Daniel van der Stoep (@Dvanderstoep), the Dutch MEP who took him into the EP. Update 10.00 (1 July): We contested R.T.I's copyright claim to the 'sign in, sod off' video on our YouTube account, on the basis that it is owned by Geenstijl who gave us permission to use it. The block on the video was subsequently removed. 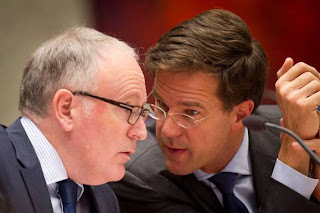 Update 14.00 (1 July): Geenstijl has formally written to Martin Schulz, President of the European Parliament to complain about the behaviour of the MEPs in question. 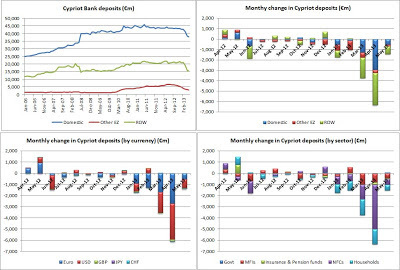 As we reported last month, the outflow of Cypriot deposits has continued apace despite the continuation of capital controls (even once the impact of the bank restructuring is stripped out the outflows have totalled around €3bn for each of the last two months). Judging from the above graphs (click to enlarge), there seems to have been some improvement in May with the outflow slowing to €1.4bn. This remains a sizeable amount given the continuation of the capital controls. Of the outflows taking place it seems fairly evenly split between domestic depositors and those from the rest of the world. The outflows also seem to be split fairly evenly across sectors. It’s hard to draw any stark conclusions from this set of data. It seems that both households and firms are continuing to draw down their deposits at a rapid pace and those foreign firms which can withdraw money are still doing so, albeit in small amounts. 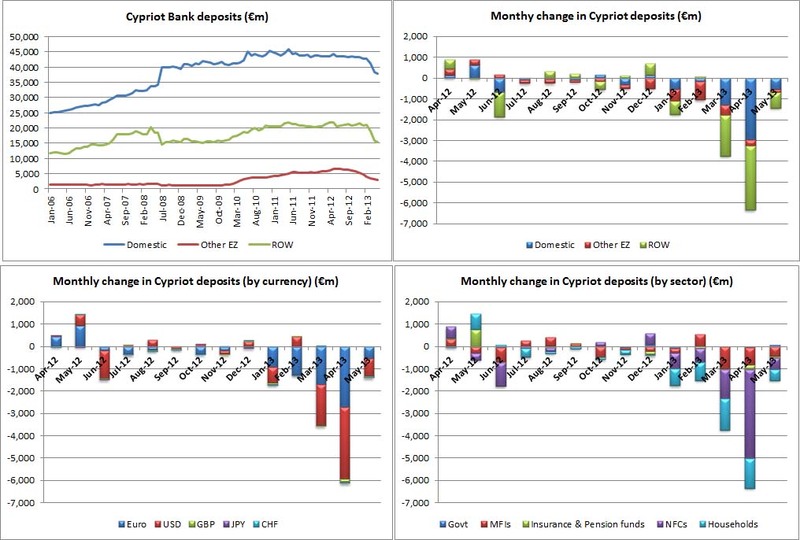 The question remains, with Cypriot growth prospects looking so bleak, when and where will this outflow stop? 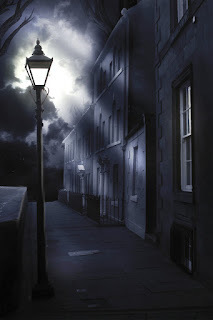 "The lamps are going out all over Europe, we shall not see them lit again in our life-time"
Today OFGEM the UK's energy regulator has issued its latest report on the UK's generation capacity and it makes interesting reading (by candlelight). The Emissions Trading System (ETS) - a market based system of cap and trade that in theory should produce the most cost effective emission reductions. In practice, an over allocation of permits and the economic downturn have lead to such a low price of carbon and it is not doing its job. The EU's renewables target -This imposes a mandatory level of renewable electricity production from renewable energy. This flatly contradicts the first policy as renewables are not always or often the cheapest way to reduce CO2 emissions. And, even if they were, by mandating them you push the price of carbon down yet further so reducing the pressure for lower emissions in other sectors. Large Combustion Plants Directive - this mandates that many coal fired plants should close on pollution grounds. In the UK these policies have been supplemented by the Treasury's self-imposed carbon price floor which effectively funnels more cash to non fossil fuel electricity production. 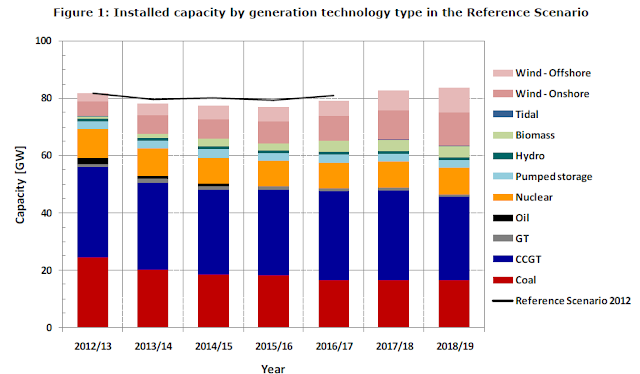 As renewables are already heavily subsidised this is in effect a subsidy for nuclear. And if no new nuclear plants are built it is really a pointless bung to existing plants. Despite some sizeable differences, EU finance ministers finally managed to reach an agreement on the bank bail-in plans last night (after only 25 hours of talks in the past few days). As always with this type of EU deals, it is a compromise and often an imperfect one. The agreement was much as expected in the end, given the drafts circulating over the past week. Below, we lay out the key points and the positives and negatives of the deal as we see them. 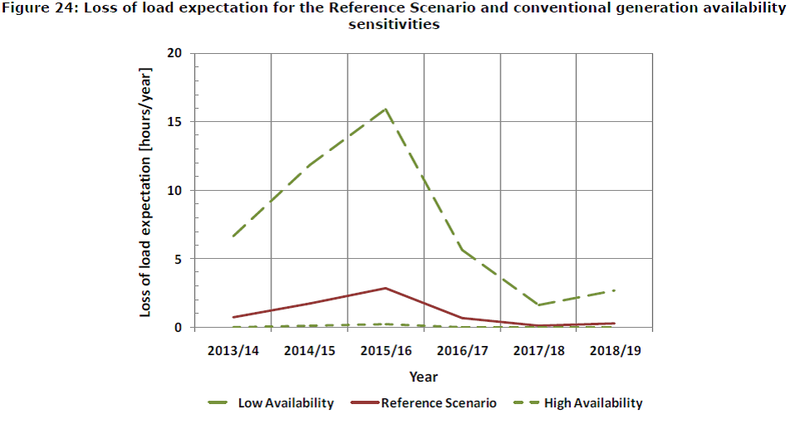 Some more flexibility included, with government allowed to inject funds but only after minimum bail-in of 8% of the total liabilities of the failing bank – although such intervention is capped at 5% of the bank’s liabilities. The ESM, the eurozone's bailout fund, can also inject funds but only after all unsecured bondholders wiped out. The UK secured wording which allows it to avoid setting up an ex-ante resolution fund, as long as it is already receiving funds from the bank levy and/or stamp duty. Sweden also secured an adjustment to the text which allows for it to maintain its current model to a large extent. The agreement sees the bail-in plans coming into force in 2018, while the directive as a whole still needs approval from the European Parliament - so it could yet change. Certain creditors are excluded: insured deposits, secured liabilities, employee liabilities, interbank and payment liabilities with maturities of less than seven days. National resolution authorities can also exclude other creditors in exceptional circumstances. As in earlier drafts, insured deposits are completely protected, and the preference given to SMEs and individuals deposits (see here) has been retained as well. 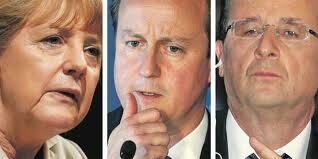 Reaching a deal is positive in itself, as it adds some much needed certainty following the Cypriot crisis. It also keeps the progress towards banking union inching along. The burden has been shifted away from taxpayers towards bank creditors. The added flexibility is important between eurozone and non-eurozone countries, with the UK and Sweden scoring some important caveats. The deal highlights that non-eurozone countries can still have influence on such rules and the acceptance of the need for flexibility between the two groups. From a eurozone point of view, the flexibility could be counterproductive, particularly the use of exemptions in exceptional circumstances. How exactly will this be defined and determined? If at national level, then there could be clear political pressure in a crisis to invoke this. For example, it is hard to imagine that the crises in Greece, Portugal, Ireland and Spain would not have triggered this in some way. Could see cost of bank funding rise, particularly in terms of unsecured credit due to fairly strong depositor preference. Lots of unanswered questions – not least, when and how will these rules apply? It’s not clear in exactly what situation and at what time the new rules would kick in. Does it rely on a request for aid from the bank or the national government? Furthermore, there are questions over how this will work practically in different circumstances – for example, the difference between a bank which has almost completely failed and one which is simply struggling to recapitalise. The timeline also still seems very long, with the actual bail-in rules not in force until 2018, even though the directive is due to be in place by 2015. That said, the broad template may well still apply, particularly where banking union is involved. In the end, this seems to be a reasonable compromise - not least because all sides seem fairly happy. It’s clear than a new set of rules was needed with the focus on creditors rather than taxpayers. That said, though, this is in the end only a very small part of banking union and the pace at which the eurozone is proceeding towards it remains fairly limited. The key remains the single resolution mechanism and/or authority. As we have argued before, until this is in place it is hard to see how the poisonous sovereign-banking-loop will be broken or how cross border lending will begin flowing freely again. Until that is settled, the effectiveness of other factors such as the bail-in plans will remain unclear at best. If you thought the wave of French attacks on European Commission President José Manuel Barroso was ebbing away, you were wrong. Today, it was the turn of French Socialist MP Claude Bartolone - who's also the President of the National Assembly, the lower house of the French parliament - to fire on all broadsides. "Barroso is an outdated man. Angela Merkel is right when she says that he is a casting mistake [not sure what Mr Bartolone is referring to here]…His way of acting is intolerable…But, above all, Barroso embodies a Europe that no longer corresponds to today’s world…Barroso is not the Europe of the XXI century, more protective, more concerned about growth and employment." Importantly, it seems the French government is not distancing itself from the latest remarks made by Industry Minister Arnaud Montebourg, who has accused Barroso of being "the fuel" of France's far-right Front National and other populist forces across Europe, such as Beppe Grillo's Five-Star Movement. "As regards the substance of the remarks, that is, reminding the European Commission that European governments and the people they represent have their role to play on the European stage…these are remarks we do share." "By promoting this [free trade] treaty [with the US], that risks translating into a rise of euroscepticism, Barroso shows that his agenda is no longer European, but Atlantic. 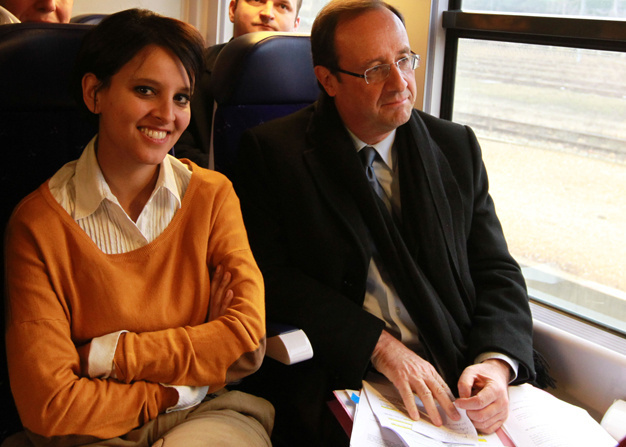 According to our information, he is preparing to campaign to obtain the post of Secretary General at the UN or NATO. For that, he needs the consent of the Americans – hence the guarantees he gives them [on the EU-US free trade deal] and the attacks on France." While all eyes will be on George Osborne and Ed Balls this afternoon, the EU Commission has slipped out its draft annual budget for 2014. This is important as it the first budget to be drawn up using the reduced expenditure limits (or 'ceilings' in EU-speak) agreed by David Cameron and other EU leaders in February. However, the European Parliament so far refused to sign off on these, so they remain provisional for the moment (more on this later). Here is our breakdown of the content of the budget according to the good, the bad and the ugly, continuing an earlier OE tradition. Compared with 2013, there's a cut to the 2014 EU budget. The headline figure is a cut in both commitments and payments from €151.6bn and €144.5bn down to €142bn and €135.9bn respectively. This is a 6% cut in commitments and a 5.8% cut in payments. This is clearly a win for David Cameron who was mandated by parliament to secure a real terms cut in spending, but is also not all what it seems to be (see below). Next year's savings would be even lower if not for the fact some spending - such as the new €6bn youth unemployment initiative - is being 'front loaded' onto this years' budget. Some particularly wasteful spending has been cut, for example the commitments on 'Communication actions' defined as spending aimed at "increasing the interest, understanding and involvement of citizens in the EU integration and policy-making process" has been cut by 20%. Somewhat bizarrely, the above savings have only materialised because a lot of money has been added onto the 2013 annual budget via a number of 'amending budgets' (a favourite tool for the EP and Commission) - increasing the total from €132.8bn to €144.5bn. If not for this additional cash, we would have seen an overall increase in 2014. While some of this additional spending can be justified - for example to accommodate Croatia - many believe that the bulk has been requested by the Commission simply to use up all the available money left under the current long-term budget rather than because it corresponds to an actual need for funds. The European Parliament has made payment in full of this amount a pre-condition for agreeing to the 2014-2020 budget, and so far most of it has been pledged by member states (although the UK was recently outvoted on committing an additional €7.3bn of the additional funds requested as annual budgets are decided by QMV, not unanimity). In total, €3.9bn remains outstanding, so taking this off the total means we only have a reduction of 3.2%. The substance of the budget remains broadly unreformed with the bulk of the budget still going towards distorting farm subsidies and regional development subsidies for wealthier member states (although the proportion of the latter has been reduced). In fairness overall spending on the CAP has decreased by 2.3%, but the amount going on farm subsidies tied to land ownership or production levels (the new CAP rules allow some re-coupling) will go up by 0.3%. While the drop in spending on European Schools is welcome, many of the other headings see increases at a time when the EU should be busting a gut to cut down on administrative spending, as member states have been for the last couple of years. The Commission has made some cut backs but due to salary increases of 0.9% it sees a 0.1% increase (or 0.8% increase when including cost of Croatia's accession). Spending on EU officials' pensions has also increased by 7.2% due to the number of staff retiring ahead of the entry into force of the new Staff Regulations. This highlights the need to make further and more urgent progress on making EU expenditure on former officials' pensions sustainable. While the Court of Auditors, an institution that often flags up EU waste and mismanagement, sees its budget cut by 4.2%, the European Parliament sees its budget go up by 1.7% despite the fact that it has not committed to reducing its headcount unlike other institutions. This news comes the day after we highlighted a video of two MEPs pushing and shoving a journalist who had the nerve to challenge them for allegedly signing in to claim to their daily allowance before 'sodding off' straight away. 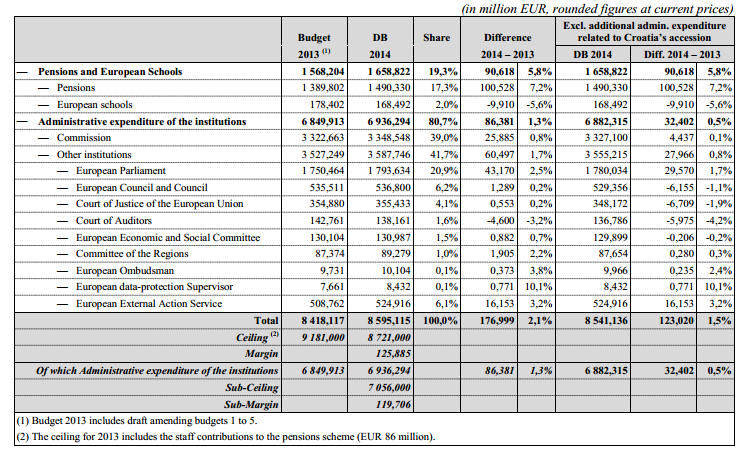 Spending on the EU's 'decentralised agencies' which form the bulk of the EU's 52 quangos are set to receive a 3.8% increase while the European and Economic and Social Committee and the Committee of the Regions see a 0.2% cut and a 0.3% increase respectively despite the fact that these organisations are outdated, with no evidence of their usefulness whatsoever. While expenditure on the EU's external policies (aid and development) sees a fairly substantial cut of 8.2%, for some reason the institution that manages this expenditure - Baroness Ashton's External Action Service - has been awarded a 3.2% increase. 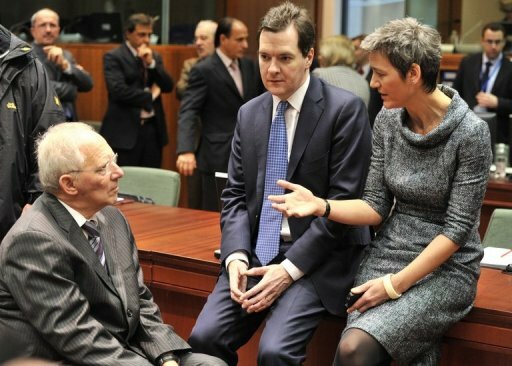 In contrast the FCO sees an 8% cut in todays spending review. The deal all rests on the European Parliament agreeing to the 2014 - 2020 MFF otherwise the 2014 budget will revert to 2013 ceilings + 2% for inflation. While this would not be an awful result for the UK mainly because of the security guaranteed by the rebate (see here for details), it would nonetheless most probably not result in an actual cut, thereby undermining David Cameron's claim to have achieved a degree of EU reform by cutting the budget for the first time in EU history. The EU budget proposal of the Commission for 2014 is again supporting the recession and unemployment instead fighting it. Italian MEP Renato Baldassarre has responded to the posting of the video in which he's seen pushing and slapping a Dutch journalist (or at least the journalist's microphone) after being caught on camera allegedly signing in for a day's work, and then sodding off. We posted a cut down version of the video on our blog, and it has generated quite a bit of interest . As we're always keen on a right to reply, we've now translated Mr Baldassarre's response below. 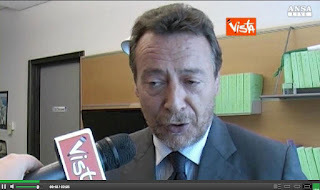 Again, judge for yourself (and if you understand Italian, the full interview is available here). "First of all, I’m really sorry about that episode and the relevance which was given to it. But the truth has to be re-established. I answered the questions that I understood in a very correct fashion, until the insistence – and I would also say the rudeness – of the interviewer has triggered a reaction, perhaps excessive, but also justified by the fact I was not exactly in the best of moods given that around that time I had received the news that a very close relative of mine had been hospitalised." "That said, this is about the usual episodes aimed at highlighting waste and privileges allegedly involving the European Parliament...I have a very high attendance record, 90% in plenaries and 85-86% in the various Committees. On that specific day, I had just arrived and was going to my office where I stayed until 10pm. Therefore, I really believe the whole fabrication around this episode is frankly excessive." Sign In, Sod Off... and Slap! SISO? What could this mysterious four-letter acronym stand for? A complex and bureaucratic way in which MEPs claim expenses back from the European Parliament? Hardly. SISO stands for 'Sign in and Sod Off'. MEPs receive various forms of allowances (and some expenses), one of which is the daily allowance, intended to cover expenditure on food and accommodation for every day that they are physically present in the European Parliament, be it in Brussels or Strasbourg. The idea, of course, is that they do work. However 'SISO' involves MEPs rocking up at the EP - signing in - a pre-condition of claiming the €300 of daily allowance - before promptly sodding off without doing any actual work. That's not exactly how the daily allowance was intended to be used. There have been cases of this practice being captured on film in the past, and while it always makes for hilarious viewing, it remains a PR disaster for a body already struggling with legitimacy. The video below shows Staal confronting two MEPs, Czech MEP Miroslav Ransdorf (from the EP's far left GUE group) and Italian MEP Raffaele Baldassarre (of the European People's Party) after the two have allegedly signed in and left straight away. Now, we must stress that we haven't seen the whole chain of events and since the MEPs in question aren't exactly keen to talk, we don't know their side of the story either. So we're NOT saying they are necessarily guilty of signing in and sodding off - the jury is still out on that. But, regardless, the MEPs' reactions aren't exactly dignified. ‘Lei chi è? Cosa vuole?’ (Who are you? What do you want? ): Fingers and thumb come together with hand shaken up and down repeatedly – the arm can also move and the speed varies depending on how angry you are. ‘Calma, calma’ (Calm down, dear): Move your hand (or both of them) as you were pushing something invisible down, with the palm(s) directed towards your interlocutor. This is the gesture actually made by the other Italian guy - the one in the dark suit - not the MEP himself. There should be no doubt that when push comes to shove, MEPs aren't afraid to throw their weight around - literally. So is this a case of unfair and overly aggressive investigative journalism, or a slap on the face of European taxpayers? You decide. Berlusconi will turn 77 in September, meaning that he is unlikely to serve any time in prison anyway because of his age. Clearly, the big question is what impact Berlusconi's trials could have on the stability of Italy's coalition government - whose survival depends on support from his PdL party. The short answer is: no-one knows. So far, Berlusconi has consistently stressed that these are two separate issues, and his "loyal support" for Prime Minister Enrico Letta will not be affected by the outcome of his trials. However, caution is needed for one very simple reason. Berlusconi may be playing the responsible statesman right now, but this is in part because none of the rulings against him are definitive, yet. Remember Berlusconi is facing several different trials at the moment. One of them (the Mediaset trial, where he is accused of tax fraud) is drawing to a conclusion, with the final verdict from Italy's Supreme Court expected by the end of the year, or in early 2014 at the latest. If the Supreme Court were to upheld the previous two rulings, Berlusconi would face a four-year prison sentence and a five-year public office ban - which would virtually mark the end of his political career. At that point, the consequences for the Italian government would really be unpredictable. A key member of Berlusconi's party, Senator Maurizio Gasparri, even suggested that, if the former Italian Prime Minister were issued with a definitive public office ban, all his MPs and Senators could resign en bloc. 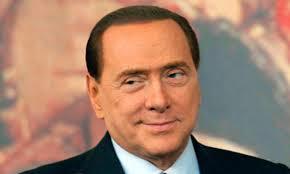 Berlusconi will meet Prime Minister Letta this evening. In theory, the meeting should focus on this week's EU summit - but the ruling will almost inevitably be discussed as well. We will keep you posted about any interesting developments via Twitter @OpenEurope. As we have pointed out repeatedly, those who think that the eurozone is one German election away from a full banking and fiscal union (which includes a surprising number of British eurosceptics) should have another look around Europe. As we noted last week, the latest draft of the bank recovery and resolution directive left plenty of questions unanswered. That EU finance ministers failed to reach an agreement after 18 hours of talks on Friday is therefore not entirely surprising. What is perhaps slightly more surprising is the dividing lines and in particular which countries found themselves arguing the same side. We highlighted before where each country broadly stands on this issue. This does not seem to have changed much, although the focus of the discussions has. Previously, much of the emphasis was on ‘depositor preference’ – i.e. when and to what extent uninsured depositors would face losses during a bank bail-in. Not exactly surprising given the Cyprus debacle. A broad consensus seems to be emerging around a structure which protects insured depositors completely and gives added seniority to those uninsured deposits held by individuals and small and medium size enterprises. With the pecking order broadly settled, focus has shifted to the level of flexibility allowed within the structure, in particular whether bail-ins should be automatic or whether there should be sizeable national discretion to decide on which format to use. One led by France, the UK and other non-eurozone countries, arguing for greater flexibility and national discretion – although presumably for different reasons, the UK because it fears its financial sector is larger and more varied than many in the eurozone and France because it is keen to keep open the option of a bank bailout due to fears automatic bail-ins could increase funding costs (souveraineté). The second group is led by Germany and the Netherlands, both of whom are keen to limit flexibility to allow for a standard framework across the eurozone and also partly because they fear governments will put domestic political needs above those of the single currency as a whole. This is a trust issue as these countries' taxpayers may one day have to stand behind the continent's banks. Ignoring the technical details for a bit, the wider political dynamic at work here is fascinating. France is actually on the side of the non-eurozone countries. This is bending assumptions as it's usually France that is the keenest on doing stuff at the level of 17 rather than 27, as Paris is proportionally stronger in that smaller constellation. Germany, on the other hand, prefers 27 to 17, for the opposite reason. There seems to be good reason to expect some greater flexibility for non-eurozone countries, with the idea reportedly gaining support towards the end of negotiations. Now, we don't want to read too much into this but first, this dynamic suggests that France could actually find itself isolated within the eurozone (we're looking forward to that FT headline). Secondly, as we have mentioned in the past, perhaps this is another indication of how Paris - who used to see the euro as a way to lock in Germany - is actually getting quite nervous about losing the UK as a balancing force in the EU. As ever in Europe, there's always that political sub-story worth keeping an eye on. and should not be doing? For anyone involved in the EU reform debate, this is a must-read. The Dutch government has today published its “subsidiarity review” – an assessment of what the EU should and shouldn't be involved in. Again, we're first to the punch in publishing an English version of the document on our blog. This is likely to be welcomed with open arms in Whitehall – and should be studied carefully by MPs in Westminster. Though not all good news for David Cameron’s renegotiation strategy – the Dutch have explicitly said they don’t want EU treaty change for example – this is clearly a major step towards a reformed Europe. First, it shows that discontent with the EU status quo is not simply a UK phenomenon – or a Tory problem as some commentators would have us believe. Secondly, the ideas the Dutch are putting forward are in themselves pertinent, and would go quite some way in achieving a better functioning, more democratic and better focused EU. 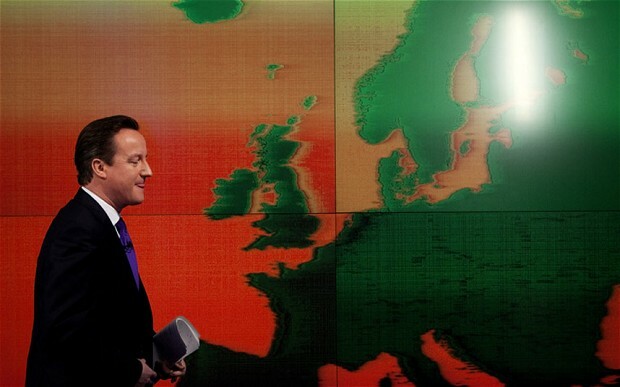 Finally – and this is where it gets really good news for Cameron - countries like Sweden. Denmark and Germany are far more likely to be persuaded down the reform path if the Dutch are prepared to take a lead with the UK. So what does the document say? Well, it sets out nine broad principles and 54 specific recommendations, relating to what the EU should and shouldn't do. Many of the proposals have also been championed by Open Europe in various forms (it’s worth re-visiting our “European localism” paper). Most significantly, in the press release, the Dutch government proclaims that the “time of an ‘ever closer union’ in every possible policy area is behind us”. This is not going to go down well in certain corners in Brussels. The guiding principle is described as “European where necessary, national where possible”, and the tone of the entire document chimes well with Cameron’s EU speech, calling for a “European Union that is a more modest, more sober and at the same time more effective.” Interestingly, it notes that the Dutch EU Presidency in the first half of 2016 “could play a role in promoting such an agenda” – this could coincide with the beginning of the EU referendum campaign in the UK should Cameron be in power. When there are widely shared objections to EU legislation, there should be a mechanism to stop the Commission taking any further initiative in that area – this is a bid to stop new EU laws in areas where national governments don’t want them. CO2 emissions should be dealt with at the global level rather than via EU legislation. There are also some further detailed examples of where the EU has gone too far and where powers should be rolled back. For example, the suggestion is made that flood risk management should only be harmonised at European level for truly trans-boundary water courses. 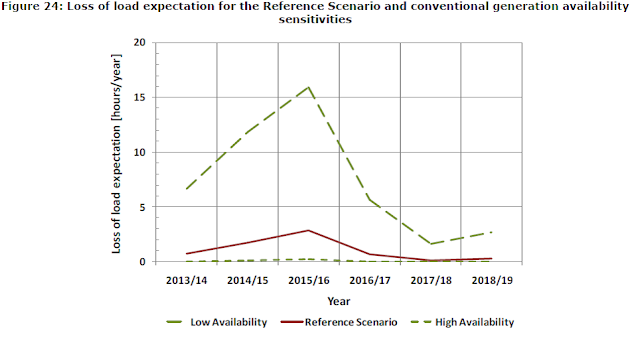 The report also recommends the phasing out of the EU programmes for school milk and school fruit, and heavily criticises the recent proposal to ban refillable olive oil jugs from restaurant (which was eventually dropped by the European Commission). However, the document also sets out clear limits to what the Dutch government says it is prepared to consider and it does not does call for entire policy areas to be returned to national governments. The Dutch government also says it is “not interested in treaty change or opt-outs” for itself. Nonetheless, the fact that one of the EU’s founding members has stated that "the time of ever closer union is behind us" is clearly a major development.